I’ve never been particularly convinced by prequels or sequels to well-known books that are penned by a different author to the original. It seems to me that they are either Hollywood-like attempts to cash in on a popular character or story or a kind of high quality fan fiction, an ersatz effort to ape the original. 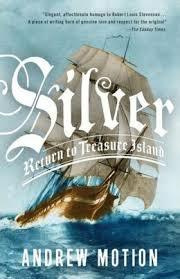 So it was with a certain apprehension that I approached Silver, Andrew Motion’s sequel to the classic Treasure Island. Like virtually everyone, I had read the original as a child and I was intrigued as to how Motion would treat one of literature’s best loved childrens’ stories. The result? Fun but flawed. The main narrator of the story is Jim Hawkins, son of the cabin boy of the same name in Treasure Island. As Silver opens, young Jim is trapped assisting his father in running their pub, Hispaniola, in the Thames estuary. Jim, a loner who is happiest spotting wildlife in the marshes, is approached one day by a young woman, Natty, whom, it transpires, is the daughter of Long John Silver. Silver is keen to get hold of the bar silver that the pirates had left behind on Treasure Island (with Stevenson maybe having an eye to a sequel himself). He has Natty persuade young Jim to betray his father by stealing the legendary map of the island and together, Natty and Jim sail off to Treasure Island to try and find the missing buried treasure. Silver is a fun and atmospheric tale, full of thrills and excitement. Motion manages to find a suitably Victorian writing style and, although the opening few pages drag a little, the pace of the book soon settles into something pleasingly fast-moving. He has a particular gift for detailed description which shows up well in the scene where Jim steals the map and also in the descriptions of sailing through the outer reaches of the Thames, where the writing is so good, you can almost smell the estuarine air. Andrew Motion is, of course, best known as a poet and Silver shows both the strengths and weaknesses of the poetic approach. On the one hand, the descriptive parts are fantastically well-crafted with a wonderful breadth of language and his fine ear for words allows him to strike a tone that, while I am not sufficient of a Stevensonian to be able to say is authentic, has a period ring without succumbing to the density and prolixity of some Victorian writing. On the other hand, Motion sometimes misses some opportunities that a more natural novelist might have pounced on – the key villains come across as a little flat and run of the mill (certainly by comparison to the original novel) whilst he passes up the chance to turn the tension between Jim and Jordan Hands (nephew of Israel Hands from the original) into a strong sub-plot. I think the crux of the matter lies in the opening paragraph of this post. Talented as he may be, Motion is no Stevenson. Silver a pretty good adventure story (although a little confused as to its intended readership – it doesn’t quite have the air of a childrens’ tale which is what it should be) but it pales by comparison to Treasure Island which, after all, pretty much created all of the familiar tropes of the pirate story and inspired other classics such as Peter Pan. And that’s the problem because once you adopt the world of Treasure Island, that’s the yardstick against which you are going to be compared and Silver, understandably, comes off second best. It’s a shame because the result of the comparison will probably lead to Silver being underrated or overly criticised. The other thing that irritated me a little about Silver is that it is a little anachronistic. In the original, the pirates were authentically rough and hard, being prepared to mutiny to get the gold. There was also a pleasingly moral ambiguity in the story, particularly in the figure of Long John Silver himself. Silver, by comparison, has a 21st Century liberal morality running through it. The attitude of Jim and Natty’s crew towards issues like slavery and the treatment of women seems implausible even in a historical setting where slavery was on the verge of abolition. Even if abolitionist views were spreading, it seems unlikely that a rough crew of buccaneers and sailors would have imbibed them so thoroughly so quickly. Furthermore, despite one or two half-hearted efforts by Motion, there is no ambiguity or moral uncertainty amongst the characters. The crew are loyal, honest and decent and, with the partial exception of Junks, the maroons are blackhearted. Only Long John Silver retains a ambiguity about him and he plays a relatively limited direct part in the story (which is a bit of a missed trick). All of this means that, as I have said above, Silver is a perfectly good adventure story but not a patch on Treasure Island. It's a good, nostalgic way for those of us who loved Treasure Island as children to reconnect with it (and maybe our childhoods). If that's you, I’d recommend it as a good effort to create a follow-on story (and one which itself leaves open the possibility of a further sequel) and it won’t disappoint the general fan of pirate or nautical adventures but it remains a flawed work that acts as a good exemplar of why sequels to great novels should probably be best left to the author of the original.